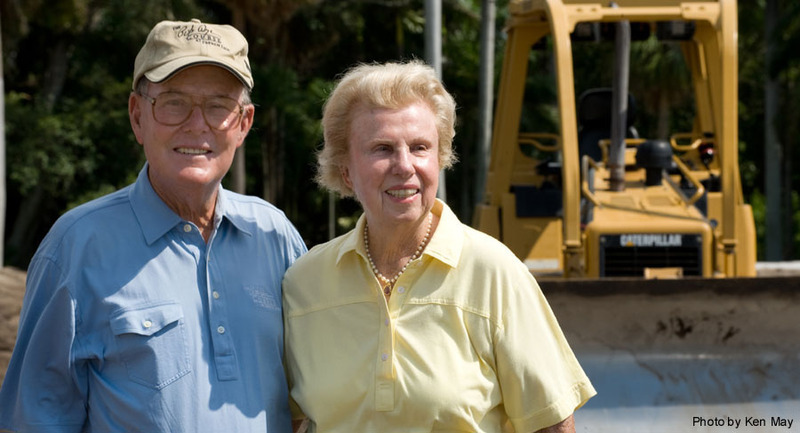 The two world-renowned Golf Course Architects, Alice Dye, ASGCA and Pete Dye, ASGCA were married in 1950. 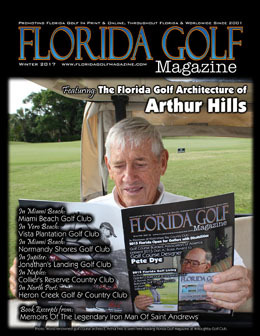 My architectural philosophy has evolved as the game, the players, the equipment and course maintenance accelerated. In the early 1960s when Alice and I decided to try to build golf courses, the game was played by walking golfers with wooden headed clubs, steel shafts and a moderately lively ball on inch high blue grass fairways. The rough was un-watered and full of dandelions, buckhorn and clover. Development of the graphite shaft and metal woods made a difference, but it was fairway irrigation, the lower cutting greens mower with the groomer, and then the Stimpmeter that changed how the game was played. One quarter inch bent grass replaced the higher cut blue grass and fairways had to be watered. The game was played more in the air instead of on the ground where players had enjoyed the extra distance the ball rolled. 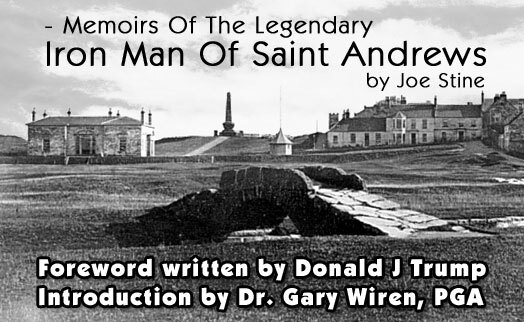 Our trip to Scotland in 1963 gave us powerful visions of golf course design. We wanted to incorporate every feature we had seen including railroad ties, pot bunkers, fairway swales, rock walls, steep bunkers, and blind holes with the ringing of a bell to let players know the green was clear. Crooked Stick, our first course after returning from Scotland, was the original course to manifest many of these images. We had no idea, even a hope, that it might become popular for national amateur tournaments or even a major Championship. We certainly never thought of gallery or corporate tent considerations back then but a requirement today when we build a course with professional tournament potential. Before Crooked Stick construction began, Alice and I walked the land. It was mostly cornfields divided by a small woods We thought about where holes would fit best, what the visual impact would be, and how shots to the green would be played, something we still do today. In a sign of things to come, we never had official plans of any sort but instead laid out the routing on our dining room table with small slips of paper five inches long for the par 5’s, four inches long for the par 4’s and 2 inches long for the par 3’s. We made sure the holes ran in good sequence and the par 5’s and 3’s all in opposite directions. Other Indianapolis area courses were enjoyable but we wanted a course to really test the best players who would become members. We both had played in national tournaments and seen famous courses so we had a background of ideas to add to the Scottish images. The back nine at Crooked Stick was started first. I had returned to check on Radrick Farms and had a chance to visit the Alistair Mackenzie course by the football stadium. I was deeply impressed with Mackenzie’s work and copied his style of large rolling greens on several holes at Crooked Stick’s back nine including a copy of his horseshoe green encompassing a bunker on #15. After completing the back nine, we began the first nine holes. Donald Ross’s Pinehurst concepts crept into my mind especially his features of left to right driving holes with the green entrance right to left. We also began to copy his manner of smaller, swale-type greens. We were trying to build a great course by copying the styles of the best forerunners but we were gradually gaining confidence to express some of our own ideas and experiences from our visit to Scotland. Then at Harbour Town Golf Links, with Jack Nicklaus’s approval, we developed entirely new concepts. We designed multiple tees and small target greens. Fairways were actually wide but visibly narrow. We used railroad ties to bulkhead greens, planks to bank bunkers, tall waving strands of pampas grass for accent and the controversial pot bunker. 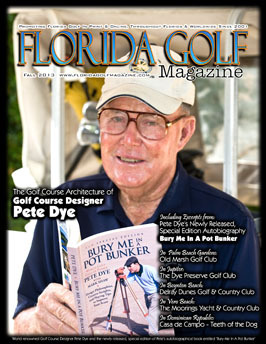 We now had a Pete Dye style, one with fresh and unique ideas and concepts. Through the years, we continued our design concept of the deceptively wide fairway for the drive off the tee as we wanted the expert player to enjoy attempting a long hit. The driver probably causes more trouble for the better players than any other club and I want them to have it in their hands discouraging the hybrid club layup. For the averages player, we believe the landing area begins in front of the tee. A cross bunker, stream, ravine or other hazard that would only be a nuisance to the skilled player could be a nightmare for others. We want the general players to get off to a good start as their drive into trouble usually causes a continuing disastrous hole. The position of fairway bunkers continues to be very difficult as we do not want to penalize the shorter tee players. Therefore we kept fairway bunkers only on one side and shallow enough for recovery but deep enough to present a challenge. We do believe in creating some severe greenside bunkers requiring strong lofted shots but there is always a level walking exit place. Alice will not allow bathtub bunkers. From experience, we know that better players often hit their approach shots over the back left side of a green so we usually give them a difficult bunker shot from that position. Except on par 3’s, we no longer completely bunker the front of the green allowing an entrance of some kind. I prefer the sand in the bottom of the bunker to be level with a small grass ledge along part of the bank so the player does not have to tread through the sand. I like the backs of the bunkers scruffy and un-watered giving a color definition since watering tends to turn everything green taking away the sharp outline and any natural look. My philosophy when building greens is that they all have depth. We may offset some greens but usually the entrance is straight on. We began using a great deal of contour but with green speeds so quick these days, we keep the rolls at 1 ½ inch to every 10 feet. I wish I could contour more but the new speeds won’t allow for it. We do try to keep the greens at ground level so that the back ground is natural and the player may view the surface. At the Kohler courses and French Lick I eliminated any background behind the green so the green appears to go off into the lake or into space. Drainage has always been an issue. I thought about how sump pumps worked in my basement and I decided they might work on a golf course. Beginning at Old Marsh in 1987, we located sump pumps in six by eight foot cement enclosures eight feet below ground where, when filled by a heavy downpour; they diverted the water back into irrigation lakes. They proved so successful that I continue to use sump pumps as this helps the drainage and directs water back into the irrigation pond. Regarding water hazards and their placement, we always think of them as the toughest penalties imposed upon golfers. Water does provide an aesthetic addition to any course. For instance, forgive me Pebble Beach, but the 18th isn’t the greatest hole ever built but it becomes one with the rolling waves of the Pacific Ocean alongside. The positioning of a water hazard may prove to be mental as it acts as a magnet to the mind. The Caribbean Sea at Casa de Campo’s Teeth of the Dog, the pond at Kiawah’s 17th, and Alice’s infamous 17th island green at The Players Stadium Course play with the competitor’s psyche the entire back nine. We try to build each tee the appropriate distance for the hole in terms of its challenge level. The forward tee will have the easiest angle and as the tees progressively lengthen the hole, each is set at an increasing level of difficulty by varying the angle and eye line so that the tee shot actually has less fairway space for the back tee player. We deliberately position the rear tees far behind and sometimes even in hidden areas hoping that only the best players may find them. With the golf ball being hit further than ever before, it is a constant challenge to all golf course architects. For tournaments, we have had to add additional yardage and bunkers to our existing courses. We now build some ridiculously long holes on the new courses. We certainly consider the type of golfer that may play our proposed course. Will it be for a private membership, a resort, a public fee, men only, or a housing development? If the owner envisions even the slightest possibility that amateurs or professionals will compete in national tournaments, then we factor in the need to create sufficient gallery positions and areas where corporate tents may appear. When I first walk the land for a new course, I wind my way along as my feet feel the elevation changes. I check for natural streams, lakes, specimen trees, wind directions, valleys and any other prominent features. I imagine the holes and sometimes sketch on a small piece of paper what will become my guide more than any set of plans that are finally completed if they ever are. Back at my dining room table, I now use a topographical map to work the holes into sequence. Balance is most important. The course must flow from one hole to another with directions and difficulties spread equally. The views are considered as I want the player to see the beauty or danger of each hole. I try to present two difficult holes followed by a breather for catch up. I like to conclude the round with two or three of the most challenging holes as the player is now ready for them. Once construction costs and permits are obtained with my routing sketch, construction begins and Alice joins me on the site. We have no permanent hole or green design plans in an office file so each new hole we build is unique. No hole is a copy because I believe I can improve every hole I have ever built. We use all of our past experience and maturity on each new course and try to imagine new ideas. I feel like I am trying to fit a square peg into a round hole to conceive ideas that are fresh and unique. Sometimes it may seem that I am ahead of my time, but soon others are copying my design features. On all of our courses, we want to eliminate forced carries except on par 3’s where we know what tee the player is starting from and can manage the carry. On par 5’s, we like to tempt the player to try to reach the green which we like to keep in view from the tee. On membership courses, we mold the fairway so it kicks the ball in toward the green. We keep the greens with enough depth to hold a long shot and have at least a partial entrance so players need not layup when they cannot make the carry. On any potential course site, we want to use our experience as both a player and a spectator to mold it into something special. Alice and I are always a team. I like envisioning new ideas such as wagon train cart paths, volcano bunkers, double lipped bunkers, rock boulder walls and greens floating into space while Alice insists on playability for the higher handicappers and women. In effect, we create four, five or even six golf courses in one since we build one for play by professionals, one for low handicap men amateurs, one for medium and one for high handicap men and either two or three for women. This covers all the ages and skill levels, something we never had to worry about when we began many decades ago. With so many choices, some golf courses are now permitting “composite” rounds where golfers play one set of tees on the par threes and par fives and then move up a notch to a more forward tee on the longer par fours. This is the wave of the future and I keep this in mind every time I plan a new course or remodel an existing one. 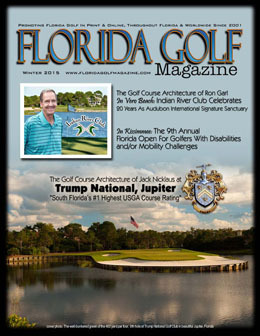 Through the years what I created at such courses as The Players Stadium Course, PGA West or the Ocean Course at Kiawah was met with heavy criticism since the professionals were just not ready for the new design concepts. Later, after they realized they could handle the challenge, they embraced the unique features and appreciated a course that would insure a win by the best player. These criticisms were understandable since I had negative reactions to St. Andrews the first few times I played it, but once I understood what the Old Course offered, I fell in love with it. Our main goal is to create an enjoyable golf experience. We want players to remember the holes, to take joy in the views and hit that one perfect shot that brings them back. We love golf and enjoy the personal challenge and the friendships the game brings. Alice and I do have an idealistic “wish list.” We hope that one day in the future there will be carts with no wheels to leave tracks on the course, no need for bulldozers to upgrade existing courses when the real solution is getting the ball fixed which is easier, cheaper and wiser, a ball that does not go as far for the power hitter but goes farther for the shorter hitter, smaller lighter golf bags that walk along with you, a grass that needs no water, chemicals or mowing, rainy days replaced by rainy nights, and more fun inexpensive family golf. Regardless, at the end of the day, golf is a great game and I often stroll one of my courses in the evening with my dog Sixty and just feel the holes, what they offer and what I could do to improve them and what might be possible with my next project. It is easy to build a difficult hole by including a bunch of hazards, trees, lakes, bunkers and mounds but it is hard to make it manageable and fun for general play. 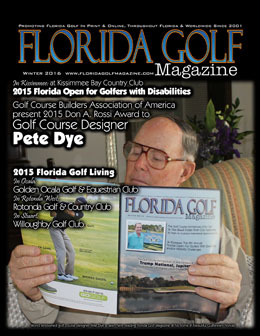 At the end of the round golfers may call Pete Dye a few unmentionable names, but that doesn’t keep me from thinking of new ways to try to challenge and thrill golfers on every hole. 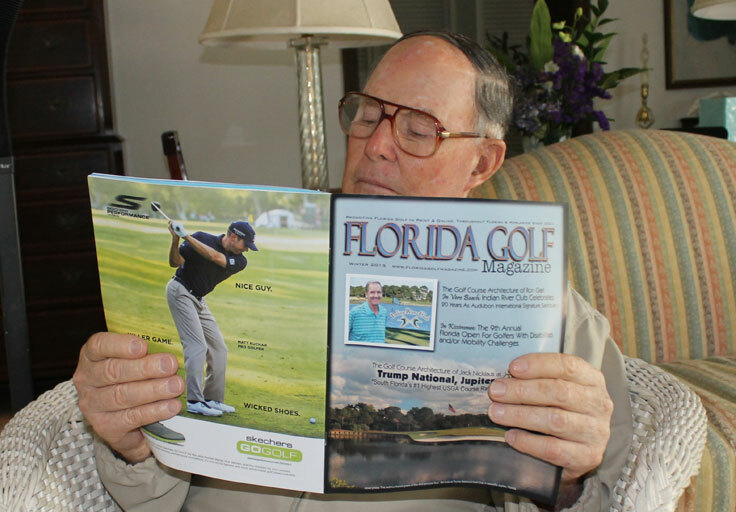 World renowned golf course designer Pete Dye, ASCGA is pictured here reading Florida Golf Magazine at his home next to Gulf Stream Golf Club in beautiful Delray Beach, Florida.